*Jacket is clean with no defects. 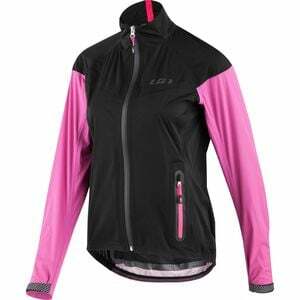 Instead of letting the threat of rain deter you from getting your daily ride in, zip up the Louis Garneau Women's Jacket and pedal off under dark skies with confidence. Featuring a waterproof, breathable 2.5-layer Extenz construction, this jacket defends you from rain, sleet, and snow on your ride while still allowing sweaty internal moisture to escape easily for dry comfort. Meanwhile, a packable pocket with a flip-over puller makes for quick and easy storage if the clouds abate, while the silicone grippers at the rear hem provide a snug, secure fit without any irritating ride-ups. A chest clasp prevents the jacket from flapping when it's unzipped to let cool air in, and the articulated elbows and stretchy design ensure you have an unrestricted range of motion on your ride.